Almost everyone wants to lose a few pounds. More than two-thirds of the United States population is overweight and nearly 40 percent of adults are obese, according to the Centers for Disease Control. Carrying around too much weight causes more issues than needing to buy new clothing in a larger size. 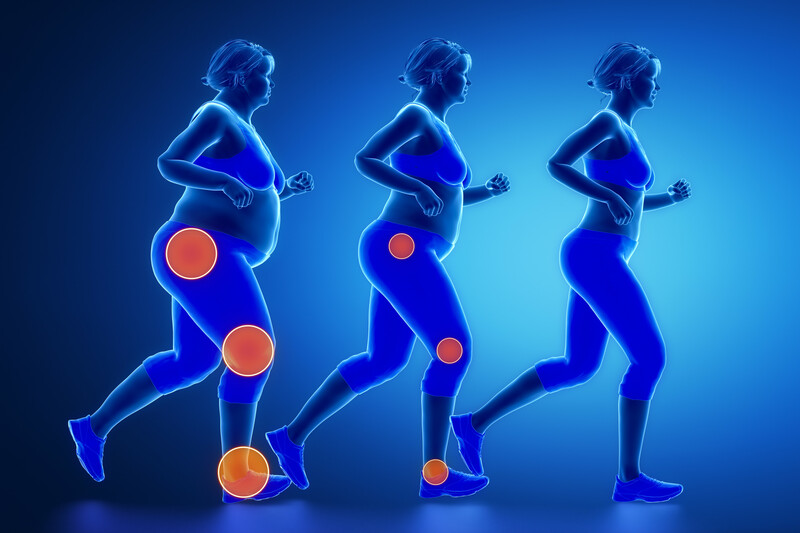 Being overweight increases the stress on your joints, which increases the chances of joint pain and osteoarthritis. One study cited by Cleveland Clinic showed that obese people are four to five times more likely to get arthritis in their knees than those who are at a healthy weight. The problem with extra pounds is two-fold. First, excess weight puts a lot of stress on your weight- bearing joints like your knees. When a person walks across level ground, the force placed on their knees is one and a half times their body weight. So, a person who weighs 200 pounds puts 300 pounds of pressure on their knees. When that same person walks up the stairs, the force is at least doubled to 400 pounds of pressure. Other tasks like squatting down to tie a shoelace multiplies the pressure by 400 to 800 pounds of pressure on the knees. The higher the weight, the more pressure is applied. Secondly, inflammatory factors associated with being overweight can cause further problems with joints. Although the hands don’t support body weight like the knees, the joints can be inflamed due to excess weight. The joints in the lower half of the body bear most of the body’s weight, so they are often the ones that feel pain first, according to the Cleveland Clinic. The knees and the hips are usually the first joints where pain is experienced. Carrying around extra weight for years will lead to inflammation and pain as the cartilage cushion within the joint is worn away. As the cushion of cartilage wears away, the bones begin to rub against each other causing irritation, pain and swelling. The joints begin to feel stiff and movement is affected. The feet are also affected by too much weight. Each foot has 33 joints, 26 bones and 100 ligaments that are all designed to help keep a person upright and mobile. Each step taken puts pressure on these many parts. The more a person weighs, the more force is felt. When these tiny joints begin to wear away, the toes may start to tingle and the ankles can throb or even swell. Losing a few pounds makes a big difference. A weight loss of as little as 10 pounds can significantly reduce the pressure on joints and therefore, alleviate some damage. Although you can’t reverse the damage done to cartilage, you can prevent further damage by losing weight. Everyone has heard that healthy eating and exercise is the best way to lose weight. It is important to remember that attention needs to be given to both diet and exercise for progress to be made. Simply adding a 10-minute walk to your day won’t get rid of the pounds. There needs to be a reduction in the number of calories also. To lose one pound means burning off about 3,500 calories and that is hard to do with an evening walk. A better plan for weight loss is to set a daily goal and stick to it. To lose a pound in a week, you need to get rid of about 250 to 500 calories each day. Start small by deciding to cut out 125 calories from your diet and burn 125 calories through exercise each day. So instead of two pieces of toast for breakfast, cut back to one piece of toast and add a brisk 30-minute walk to your day. Each week, try to subtract a few more calories and add a little more exercise. When recovering from a hospital stay, putting on a few pounds can be a real possibility since bed rest is often needed for a period of time. Motivation to move around may also be reduced if there is pain. Gaining weight can increase pressure on joints causing new pains and future issues. Choosing to recover in a short-term care facility is a way to control this unwanted weight gain and possible joint pain. The physical therapist is able to help get you moving at a safe and comfortable pace. Dietitians can provide guidance on foods that will promote healing and reduce the dangers of weight gain. Glenview Terrace, a Medicare five-star rated center for recovery, offers this level of care for all its guests. Understanding guests’ desire to quickly return to an active lifestyle, Glenview Terrace’s therapists provide customized one-on-one physical therapy seven days a week on state-of-the art equipment to speed the healing process and increase mobility. Occupational, speech, respiratory and intravenous therapies are also provided as needed. An attentive nursing staff provides 24-hour care and ensures all of your doctor’s orders are met and can quickly react to any issues. Respiratory issues will be carefully addressed to reduce the chances of developing pneumonia. A stay at Glenview Terrace is all about healing as quickly as possible in an attractive setting. Accommodations feature elegantly appointed suites and rooms with a walk-in shower in each bathroom. Thoughtful extras for short-term rehabilitation guests include morning coffee and newspaper delivery as well as concierge services. The beautifully landscaped grounds with a spacious patio and tranquil fountain also provide both an elegant and calming environment for a time of recovery. When it is time for expert care, consider Glenview Terrace, where the focus is always to help get you back to the independent lifestyle you desire. For additional information or to arrange a tour, visit glenviewterrace.com or call 847-729-9090.